St. Martin’s Press 2017, 436 pgs, Young Adult Fiction. Liesl grew up hearing tales of the mysterious Goblin King, who rides abroad in winter searching for a bride. No longer believing the old tales, Liesl is occupied with helping run the family inn, looking after her younger siblings, and composing her music in secret. When her sister is taken by the Goblin King, Liesl must travel to the Underground to rescue her. But her sister’s freedom requires sacrifice, and Liesl must pay the price with her life. As Liesl begins to fade, she must release her music to discover who she really is if she wants the chance to live. This is a dark tale of love and sacrifice, and of music and magic. 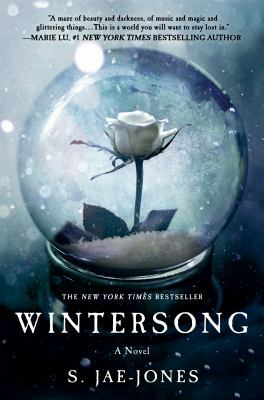 The best thing about Wintersong is the artful way Jae-Jones shows (instead of just tells) the reader what Liesl is feeling and thinking, so the reader understands how Liesl comes to her conclusions and decisions. The transitions from what is going on inside Liesl to what is happening around her were so seamless that I hardly noticed. I liked that Jae-Jones accomplished this without getting bogged down in a lot of internal dialog. I would recommend this to older teens and adults interested in goblins, magic, or music.